They say the anticipation leading up to an event can be more exciting than the actual event. That excitement is like the height of a mountain. And then sometimes delay spoils what you are looking forward to. And disappointment drags you down. Maybe that’s why the dip of discouragement feels like such a low. It feels like the opposite of that mountain high. Being content is difficult. Paul said in Philippians 4:11 that he’s learned to be content no matter what situation he’s in, but that verse and I don’t seem to be getting along lately. I’m working on it. I see others getting their chance and I want a green light, too. My heart will begin to whine, I just want—and I’ll try to stop myself right there and correct where that was going. Complaining is a hindrance. Just ask those wilderness-wandering Israelites. So I say be smart and keep moving forward when life impedes your goals. How is one supposed to keep moving forward when there’s delay? Put on some worship music and let your emotions splash into God’s lap. Cry it out! Crying releases what is pent up inside. Lay your disappointments at His feet in surrender. Then after you’ve poured out your heart, and you’re feeling empty, start worshipping Him because He is your king. Because you love Him. He will not leave you disappointed! He brings peace and encouragement in place of disappointment. “Why is this happening to me?” “Can’t I just have _____?” “Why does it seem like I’m the only one who isn’t getting to ____?” I hear myself asking these “why me?” type questions, and I realize they’re not the right kind to be asking! See, a major key to waiting is preparation. Instead, ask “What do you want me to specifically do to prepare?” Asking God for directions will channel your energy to having a proactive focus. Pray for wisdom (James 1:5) and more discernment. You need wisdom and direction in areas that will help you to prepare for whatever you’re waiting for. Invest your time in preparation. One of God’s promises is found in Matthew 7:7 (ESV), “Ask, and it will be given to you; seek, and you will find; knock, and it will be opened to you.” God doesn’t leave us wondering; when we spend time seeking Him, He gives directions. Even if it’s one detail at a time, He comes through on His promise. Now do what He lays on your heart both practically and spiritually. Think of Noah’s call to build the ark. God gave him many directions about how to build the ark, about the animals, and about food for the people and animals. It took many years putting everything into place. Embrace the vicissitudes of the season. The time isn’t wasted. You are simply preparing for what’s ahead. I know this is easier said than done so I give you permission to talk to yourself. Yep! Tell yourself you trust God. Out loud. Go ahead, say it. It makes a difference. You are telling your heart what is true, and you are also letting God be in charge. There is power in words. Pray some verses that remind you to trust Him. It makes the trusting easier. You can trust Him because He’s holding your life in His hands. “The course of my life is in Your power.” Psalm 31:15a HCSB That’s good to know! 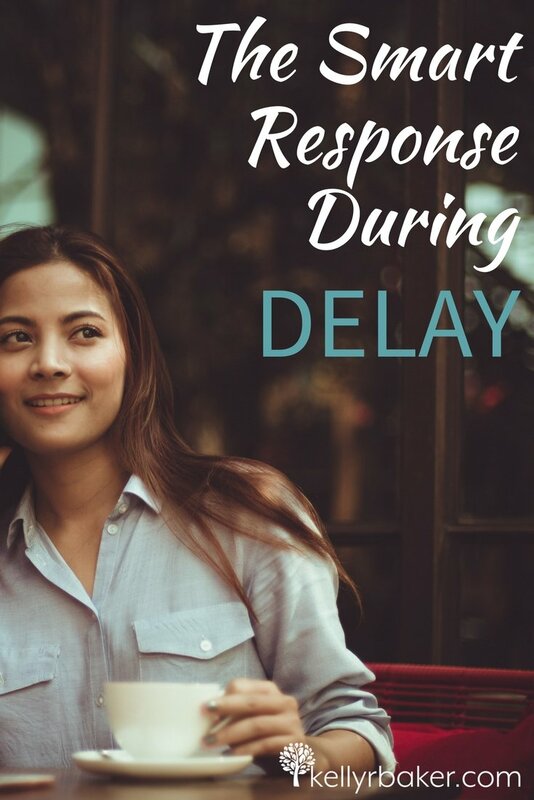 How do you deal with a delay? Pin the image above as a reminder! Do you know someone who would be helped by this post? Use the icons below to share it! Great post Kelly! Loved how you were honest and practical for steps to focus on while we wait. Everyone can relate to these seasons! Thanks, Gretchen! I’m often “telling on myself” but if it helps someone, it’s worth it. Love the advice to invest in preparation, then no season of waiting is wasted! Great tips, Kelly! I’m waiting in a couple areas of my life right now. I’m going to employ your 4 steps today!! Blessings! 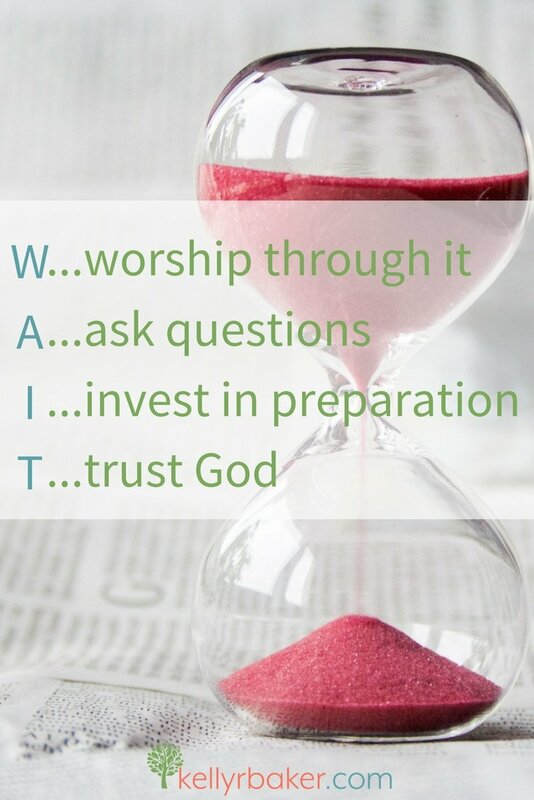 What a great acronym for the word WAIT. The one that stood out the most, is asking the Lord how we should prepare. That is such good truth because generally, we have to wait because we aren’t ready for that thing we’re waiting for. Hi, Rosanna! When I first started realizing this, it was when I wanted to get married but God showed me I wasn’t ready. Well, I wanted to speed things up. So I started being more aware of my character and allowing God to work changes in me. And of course, I continued to learn more about cooking and homemaking, etc. Amazing acronym and even better wisdom: as Elisabeth Elliot would have said: just keep doing the next thing! I’m afraid that I’m kind of a fan-girl where she’s concerned. Excellent post, Kelly. I like your suggestion of laying your disappointment at God’s feet and worshiping no matter what. Glad I found you today at #raralinkup. Great to see you here, Sarah! The disappointment seems to be the worst for me. I hate that feeling. God is the only One who can replace that! Kelly, one of the best ways for me to thrive in the waiting is to invest my time. Many times I thought I was just spinning my wheels, and hindsight showed me God was using the investing in ways I could have never known. It seems waiting is a common theme for many of us these days. Yes, it is. I’m glad God gives us practical wisdom to apply during times of delay. Great to see you here, friend! So often there is so much to experience in the waiting, but it’s hard to wait. I love the idea of using it as a time to ask for wisdom. Great to see you here again, Rachel! Yes, I guess there is a lot to experience in the waiting. As I go through the preparations I see why He is saying wait. His wisdom supersedes mine, that’s for sure! Waiting is such a tough one for all of us! What a great acronym! I think my favorite point is the asking of questions – the RIGHT questions! Thanks so much, Kelly, for sharing this hope with us at #MomentsofHope! Yes, the right questions. I used to ask the “why me” kind. lol Be blessed, friend. aaaagggghhhhhh…. I have only gotten to #1.. and, yes, that is where I am in my waiting to find another house to live in. My grumbling is better, though, because no matter what I say, I always bring it back around to God, His faithfulness, love, mercy. Ok… ready for #2… whew…. Love you Kelly .. you always tell it like it is, even when it hurts, not just me, but you too…. thanks. Ah, yes, the search for a new home. That’s a tough one. I’m glad my posts are speaking to you. Praying for you, sweet friend, and I love you, too. I love this because I don’t love waiting. Thank you! Not good at waiting here either! Your tips are helpful because I tend to complain and ask lots of “Why” questions.I love the encouragement, Kelly! I guess I got behind in my comment replies, but I’m so glad you stopped by and were encouraged, Julie! I like the acrostic for Wait, and the practical steps. It helps in the waiting if I can still feel like I’m doing something. 🙂 Visiting from Faith ‘n Friends. I’m the same way, Laura. I like to be active, but it probably stems more from my impatience than anything. Sometimes, tho, the longer I get into the waiting process, the clearer His reasons become. Happy you were here!